eCite - Does increasing ewe fecundity reduce whole-farm greenhouse gas emissions intensities? Copyright 2014 The Modelling and Simulation Society of Australia and New Zealand Inc.
Livestock are by far the greatest contributor to Australian agricultural greenhouse gas (GHG) emissions and are projected to account for 72% of total agricultural emissions by 2020. This necessitates the development of GHG mitigation strategies from the livestock sector. Currently there are many research streams investigating the efficacy of GHG mitigation technologies, though most are at the individual animal level. Here we examine the effect of a promising animal-scale intervention - increasing ewe fecundity - on GHG emissions at the whole farm scale. This approach accounts for seasonal climatic influences on farm productivity and the dynamic interactions between variables. The study used a biophysical model and was based on real data from a property in south-eastern Australia that currently runs a self-replacing prime lamb enterprise. The breeding flock was a composite cross-bred genotype segregating for the FecB gene (after the ‘fecundity Booroola’ trait observed in Australian Merinos), with typical lambing rates of 150-200% lambs per ewe. Lambs were born in mid-winter (July) and were weaned and sold at 18 weeks of age at the beginning of summer (December). Livestock continuously grazed pastures of phalaris, cocksfoot and subterranean clover and were supplied with barley grain as supplementary feed in seasons when pasture biomass availability was low. Biophysical variables including pasture phenology and flock dynamics were simulated on a daily time-step using the model GrassGro with historical weather data from 1970 to 2012. Whole farm GHG emissions were computed with GrassGro outputs and methodology from the Australian National Greenhouse Accounts Inventory (DCCEE, 2012). Increasing ewe fecundity from 1.0 lamb per ewe at birth (equivalent to scanning rates at pregnancy of 80% of ewes with single lambs, 17% with twins and 3% empty) to 1.5 (scanning rates of 20% ewes with singles, 51% with twins, 26% with triplets and 3% empty as observed at the property) reduced mean emissions intensity from 9.3 to 7.3 t CO2-equivalents/t animal product and GHG emissions per animal sold by 32%. Increasing fecundity reduced average lamb sale liveweight from 42 to 40 kg, but this was offset by an increase in annual sheep sales from 8 to 12 head/ha and an increase in average annual meat production from 410 to 540 kg liveweight/ha. A key benefit associated with increasing sheep fecundity is the ability to increase enterprise productivity whilst remaining environmentally sustainable. For the same long-term average annual stocking rate as an enterprise running genotypes with lower fecundity, it was shown that genotypes with high fecundity such as those on the property could either increase meat and wool productivity from 449 to 571 kg/ha (clean fleece weight plus liveweight at sale) with little change in net GHG emissions, or reduce net GHG emissions from 4.1 to 3.2 t CO2-equivalents/ha for similar average annual farm productivity. In either case, GHG emissions intensity was reduced by about 2.1 t CO2-equivalents/t animal product. 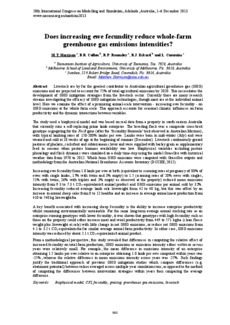 From a methodological perspective, this study revealed that differences in computing the relative effect of increased fecundity on total farm production, GHG emissions or emissions intensity either within or across years were relatively small. For example, the mean difference in emissions intensity of an enterprise obtaining 1.5 lambs per ewe relative to an enterprise obtaining 1.0 lamb per ewe computed within years was -25%, whereas the relative difference in mean emissions intensity across years was -27%. Such findings justify the traditional approach of previous GHG mitigation studies which compare differences (e.g. abatement potential) between values averaged across multiple-year simulation runs, as opposed to the method of computing the differences between intervention strategies within years then comparing the average difference.